Publix Super Markets Inc. and Costco Wholesale Corp. finished first in their brick-and-mortar retail segments on the Newsweek America’s Best Customer Service 2019 list. In addition, Publix and Costco — along with Walmart, Target and CVS Health — made the top 50 as “all-stars” in Fortune’s 2019 list of The World’s Most Admired Companies. In the Newsweek list, Publix came in No. 1 for customer service in the supermarket category with a score of 9.07, followed by ShopRite (8.95) and Trader Joe’s (8.94). Costco led the superstore and warehouse club segment with an 8.79 score for customer service, ahead of No. 2 Meijer (8.60) and No. 3 Target (8.29). Among the other food, drug, mass and convenience retailers on Newsweek’s list, QuikTrip was No. 1 among convenience stores in customer service with a score of 8.78, followed by Wawa (8.28) and Sheetz (8.23). Independent pharmacy network Good Neighbor Pharmacy, part of drug distributor AmerisourceBergen Corp., had the top score in the pharmacies and drugstores category at 8.29, beating out national chains Walgreens (No. 2 at 8.08) and CVS Pharmacy (No. 3 at 7.94). “We’re honored to make Newsweek’s list for America’s Best Customer Service,” Karen Meleta, vice president of consumer and corporate communications at ShopRite, said in a statement. 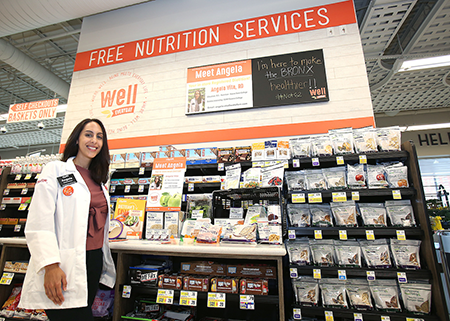 In-store dietitians are among the menu of customer services offered by ShopRite. At ShopRite, part of the Keasbey, N.J.-based cooperative Wakefern Food Corp., retail associates help customers in-store, online and through the supermarket chain’s customer care center, according to Meleta. Service via the care center, she explained, might involve such assistance as helping a pharmacy patient, having a ShopRite registered dietitian develop a menu plan developed or ensuring that a customer’s online grocery order is hand-selected in-store by a personal shopper. For the America’s Best Customer Service list, Newsweek worked with global research firm Statista to gather and evaluate data across 141 retailer and service provider categories. More than 20,000 U.S. customers were polled, with questions focusing on such areas as retailer accessibility, communication, technical competence and customer focus, as well as whether respondents were likely to recommend the brand to family and friends. The three brands receiving the highest scores in their respective categories made the list. Focusing on corporate reputations, Fortune’s annual World’s Most Admired Companies list spotlights large companies that are highly respected. Fortune partnered with global management consulting firm Korn Ferry to ask 3,750 executives, directors and securities analysts to name the 10 companies they admired most. They chose from a list of the companies that ranked in the top 25% in last year’s survey and those that finished in the top 20% of their industry. The resulting top 50 companies were deemed World’s Most Admired Companies All-Stars. Of the five brick-and-mortar food, drug and mass retailers on the All-Stars list, Costco ranked highest at No. 12. Next were Walmart (No. 25), Target (No. 32), CVS Health (No. 35) and Publix (No. 45). Fortune also highlighted most-respected companies by industry segment. In the food and drug stores category, Walgreens Boots Alliance was No. 1, followed by Publix, Sprouts Farmers Market, The Kroger Co., Ahold Delhaize and 7-Eleven parent Seven & I Holdings. Also including food, drug and mass channel retailers was the general merchandisers category. Target finished first, topping No. 2 Nordstrom, No. 3 Walmart, No. 4 Costco and No. 5 Kohl’s. Whole Foods Market parent Amazon.com came in second on the Top 50 All-Stars list. The e-tail giant ranked No. 1 in the Internet services and retailing category of Fortune’s list.